With the global market for turbines, and demand easily outstripping supply, companies such as PPM Energy are planning projects years in advance and lining up construction schedules with turbine delivery schedules two or three years down the road. PPM Energy's grassroots approach to getting approvals for wind farm projects has paid off, with recent projects-Big Horn in Washington and Klondike III in Oregon-getting an encouraging thumbs-up from local governments and residents. It's a good thing PPM Energy's Ty Daul likes coffee. Daul was the project manager for PPM Energy's Big Horn wind power project-he is now vice president of renewable business development at the company-and spent a lot of time drinking coffee in farm kitchens in southern Washington State. He was there to explain to farm families what the Big Horn project was all about, and the benefits it would bring to the small community of Bickleton. Daul's grassroots approach, and the efforts of other PPM representatives, paid off as the 200 megawatts (MW) Big Horn project got the go-ahead, was built, and started sending power on to the grid, via Bonneville Power Administration transmission lines, late in 2007. The entire capacity of the Big Horn project and its 133 GE Energy 1.5 MW turbines has been contracted to MSR Public Power Agency. MSR is a joint agency made up of the Modesto Irrigation District, the City of Santa Clara and the City of Redding, all in California. This little corner of the Pacific Northwest is not new to PPM. Big Horn sits across the Columbia River and about 25 miles from the company's existing Klondike wind power projects in Oregon. The Klondike III wind project near Wasco, Oregon became operational in 2007 and generates 221 MW of electricity. "Our interest in this area of Washington and Oregon goes back to when PPM Energy was starting to build up a business to do greenfield development, and build projects for ourselves," says Daul. "This was one of the many areas we started looking at-it was an area with good transmission capacity, good wind and open space." On the Big Horn project, PPM Energy worked closely with local authorities and citizens to address concerns about the possible impact of Big Horn on the bird population-the nearby community of Bickleton is known as the bluebird capital of the world. PPM partnered with the community to build and place more than 250 bluebird boxes around Bickleton, as a show of support for the community. The Big Horn site is similar to the Klondike site just across the river, though not identical. "They correlate fairly closely, but they have different elevations, with slightly different drivers with the wind in each location," says Daul. "On a macro level, the wind is driven by similar elements, but on a micro level, you'll see the differences." The more recent projects-Big Horn and Klondike III-are considerably larger than the earlier projects, Klondike I (at 24 MW) and Klondike II (75 MW). "Size is driven by a lot of factors," Daul says. "It's driven by the turbines that might be available, by what you can permit, and a large part of a project is driven by what you can interconnect with the existing transmission grid. And, of course, customer demand." Capacity can oftentimes evolve with PPM projects, he notes. With a number of moving "parts" going forward in parallel, it's good to stay flexible. "With those factors at work, and because these projects can take two to three years to develop before we can even start construction, we take a good educated guess on where we think the project is going to be in terms of size. But things move around a bit. One of the factors that influence the project size may take longer to mature-or not even be there. You may plan on 300 MW but then find out through the transmission study that they can only take 200 MW." In the case of Big Horn, it was permitted for 250 MW, and they had land for that amount of wind power generation. But they could only obtain an interconnect for 200 MW. "We are currently finalizing plans for that further 50 MW-in an ideal world, all of that would have come together at once, but sometimes it doesn't come together as you planned." Daul notes that a number of the company's projects have been phased, with capacity added on later. For example, the company acquired Klondike I as an operating asset, then developed Klondike II and, as mentioned, is currently building Klondike III. It would make the most sense to max out the power that could be generated on sites-and achieve economies of scale in terms of construction resources-through doing all the work at once. But PPM Energy has plenty of company in the wind power industry in not having access to all the resources-such as turbines-to do that. "There are limited turbines out there, so as a company we have to allocate them across the U.S. to different projects. It's not a situation of always being able to fit the most megawatts on every single project-we still have to satisfy customers in other states." In addition to the solid support of Washington State, PPM's Big Horn also had lots of support from Klickitat County, and, thanks in part to all the coffee meetings Daul attended, the support of local residents. So much so that PPM Energy is considering further wind power projects in the area. The front end work, with meetings and approvals, went fairly smoothly, though their construction schedule turned out to be quite aggressive, due to some bad weather. "In terms of overall timing, from when you start moving dirt and building road until when you get the turbines operating, it's usually a six- to eight-month process. Sometimes it's a bit less, sometimes a bit longer, depending on the size of the project and conditions." The Big Horn project was built during the winter months, to optimize the use of their construction crew, and to time it with the delivery of turbines. At times, however, the construction crew probably felt they were better off building an ark than wind towers; they got hit with the worst rains in 30 years. "We were able to manage through it," says Daul. "It caused a bit of a delay, but in the end, our construction team did an outstanding job and still delivered the project close to on schedule and on budget." The entire capacity of the Big Horn project and its 133 GE Energy 1.5 MW turbines has been contracted to MSR Public Power Agency, a joint agency made up of the Modesto Irrigation District, the City of Santa Clara and the City of Redding, all in California. While some areas of the region were hit with flooding, that was not the issue with the Big Horn site; most of the land in the area is made up of basalt, with two to three feet of soil on top. The heavy rainfall did not create puddles. "It just became this big, wet, slushy mat on top of the rock," says Daul. "The problem was getting trucks in and out and moving heavy equipment around. Sometimes equipment got stuck and a lot of times we just waited until the water drained off." At one point, they effectively shut the Big Horn project down for a month due to the impact of the wet weather. PPM usually acts as the general contractor on its wind projects-subbing out project components such as electrical, civil and installation-and this pays off when there are delays. "We have the in-house expertise to be the general," says Daul. "We've made a conscious decision to move in that direction to manage costs a little bit better. But it also allows us to better manage the portfolio of projects that we have under construction. "So if we have a problem, like we did with Big Horn and the rains, we just shift our resources. We moved people down to another project we were building down in Oregon where we did not have nearly as significant a rain issue. If we were not the general contractor, we would not have that kind of flexibility or it would cost us significantly more to do those kinds of workarounds." He adds that it also gives them more control over the subs hired on a job, which dovetails nicely with their efforts to hire locally, wherever possible. One of the big drivers in project scheduling-if not the biggest-is the delivery of the turbines. With the global market for turbines, and demand easily outstripping supply, companies such as PPM are planning their projects years in advance, and lining up construction schedules with turbine delivery schedules two or three years down the road. It has reached the point that key suppliers such as Mitsubishi and Suzlon are involved with PPM Energy projects at the engineering phase. "We're way out ahead," says Daul. "The way PPM views it, turbine companies and contractors aren't just suppliers-they are strategic partners. We have a contractual relationship, but we view it that we are going to be working with these companies for two, three, four years or longer. We need to make sure we're working together and getting things right." 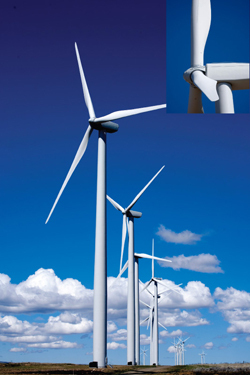 To that end, PPM Energy has signed long-term supply contracts with several turbine suppliers. This past June, Suzlon Wind Energy Corporation, the U.S.-based subsidiary of Suzlon Energy A/S of Denmark, extended its contract with PPM to add 300 MW of wind turbines. It has been touted as one of the largest single contracts in the history of Suzlon and the U.S. wind energy industry. The original agreement called for delivery of 300 MW of turbine capacity in 2008 and 100 MW of capacity in 2009. It has now been extended to include an additional 300 MW in 2009 for a total of 700 MW over two years. And Mitsubishi Power Systems has finalized agreements to supply 169 of the company's flagship MWT92/2.4 wind turbines to PPM Energy wind projects in the U.S. This 405 MW order includes wind turbines to be installed at various PPM project sites in 2008 and 2009. Of course, being part of international wind energy giant Iberdrola, with its clout, also helps. Iberdrola bought out PPM Energy and its parent company, Scottish Power last year. There are constraints beyond the supply of wind turbines. "It's getting to the point that we also have to schedule a year or two in advance for cranes," adds Daul. "It's not just the construction of wind farms that is driving this-there's all kinds of construction in the U.S. and globally that are keeping the demand high for these kinds of resources." PPM Energy is doing what it can to exercise control, from making advance crane commitments right through to managing the purchase of what are becoming longer lead items, such as cabling and transformers. "It's not just costs we are trying to control," says Daul. "It's also the schedule, as well as quality. If you're at the end of the line, and are buying the last available unit of something, sometimes you can be looking at components of questionable quality." And there are also human resource issues the industry is grappling with, with companies in competition for wind power talent. Daul says that PPM Energy works hard to create the right corporate culture to attract and retain people. "It's not just about compensation, which is obviously a factor. It's the type of people you are working with, the opportunities, the ability to have decision making and control in what you are doing." One thing that he believes sets PPM apart is their approach towards the environment. "I really feel we are setting the bar for others to follow. We go above and beyond what is required." In the case of Big Horn, they worked closely with local authorities and citizens to address concerns about the possible impact of Big Horn on the bird population-Bickleton is known as the bluebird capital of the world. Although bluebirds are common at wind project sites, they are not at high risk. PPM's studies indicated the turbines will not hurt the bluebird population, which generally flies well below the blades-and that has proven to be the case. 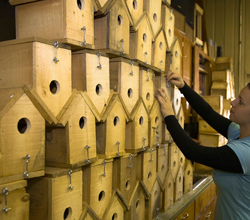 PPM also partnered with the community to build and place more than 250 bluebird boxes around Bickleton, as a show of support for the community. Daul also cited a project they are doing in Texas. "Texas siting regulations, if there are any, aren't very defined. But we follow the same process and procedures as we would in an area that requires very stringent monitoring and field studies. "From our standpoint, we want to make sure what we are doing fits with the community. We are going to be there for a long time." With all their wind projects, including Big Horn, they work to minimize the footprint. At Big Horn, canyons run through parts of the 15,000-acre site. When company officials met with local environmental groups, the groups said that some turbines were sited quite close to the canyons and asked if the company would be willing to move them back. "We did that voluntarily," says Daul. "We don't have infinite flexibility to do those kinds of things, but we will definitely work with landowners, county agencies and environmental advocates to see how we can best fit a project in an area." Out of that 15,000 acres, he notes, only about one percent, or about 150 acres, has been taken out of permanent land use. In addition, the company has also set up a 455-acre habitat south of the site. Taking an environmental approach is not only a hit with the locals-power customers also like it. "Customers say they want windpower, but they want windpower from sites that have been developed in a responsible way." Moving forward, Daul says he believes the industry is likely to see more single-phase wind power projects, rather than multi-phase, such as Klondike, or projects with capability add-ons, such as Big Horn. "I think we're going to continue to see some small projects, but the trend seems to be towards larger projects because of the economies of scale. And longer term, some of the best wind resources are in areas where there are going to have to be significant transmission fixes-spreading out the cost of those upgrades will require bigger projects." He notes that some of the richest wind resources in the country, in states such as the Dakotas and Wyoming, are also the furthest away from significant loads, "We're going to have to address that with transmission capacity to these states if, as a nation, we really want to tap into this renewable energy resource."